With sharp knife, cut 1/4-inch off stem side of each tomato and 1/8-inch off bottoms. Using melon baller or small spoon, remove insides of tomatoes; discard. Make cuts in ends of each green onion piece; place in bowl of ice water until curly. In small bowl, mix chicken salad and horseradish. Place 1 teaspoon chicken salad in each tomato. Place 1 green onion brush in top center of each tomato for stem. 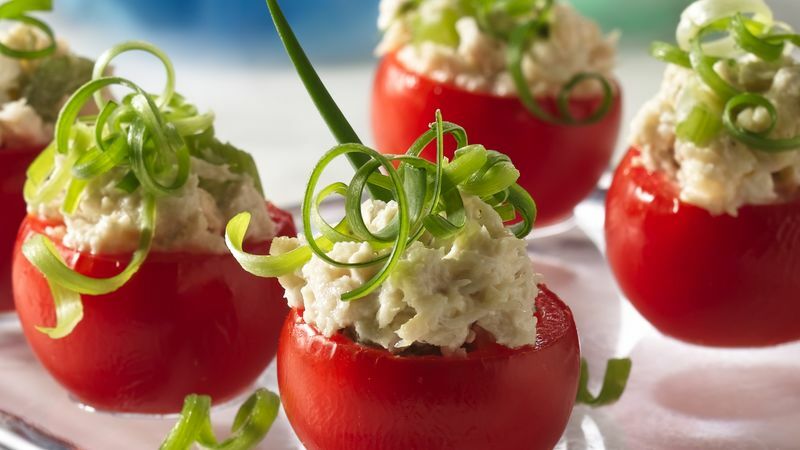 A narrow baby spoon works well to spoon the chicken salad into each tomato. Instead of chicken salad, try making these tomatoes with another deli salad.